If you’re a business owner, or dreaming of becoming one, you’ve probably thought through your business plan and how to access capital. But what about your mission statement? Your mission statement is a road map to growth – from the customers you will attract, to what the business stands for. Companies, whose employees understand the mission and goals, enjoy a 29 percent greater return than other firms, according to a Watson Wyatt Study. Your mission statement can also inspire your customers. Mega star, singer/entrepreneur Alicia Keys’ tells PINK she is in the “Business of Inspiration.” Now she’s working to help small businesses get off the ground as an investor. Inc.com says creating a mission statement is as easy as asking three questions: What do we do? How do we do it? For whom? When creating your mission statement, set aside several hours, use radiant words (i.e. imagine, accelerate, change and empower) and involve your team, says Entrepreneur.com. Plus, try adding extra inspiration with an emotional element, by emphasizing the larger purpose like bringing together the community. Want to learn from the best? MissionStatements.com compiled statements from Fortune 500 companies. 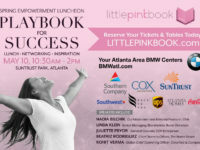 Bonus PINK Link: Wondering how to establish your company’s vision? Here’s how to take on the daunting task. PINK Profile: Alicia Keys shares her best business advice and what inspires her.